All covers are available for approval viewing. The covers shown are just a very small sample of my stock. Please tell me more about your collecting interests and what types of covers you are seeking. 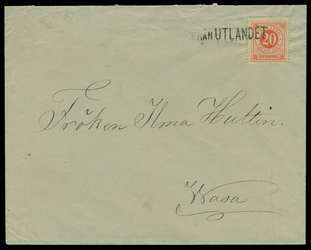 46 [1886 20 öre Ringtype Posthorn on Back] (F-VF) on June 1891 cover to Finland, with Finnish "FRÅN UTLANDET" cancellation and NIKOLAISTAD "Finland style" 5 June 1891 receiver. Unobtrusive tear at top, away from the stamp. Either posted in Sweden uncanceled (doubtful), or handed to a ship leaving harbor (typical), or posted on board a Swedish-flag ship en-route to Finland (typical). Very attractive with brilliant orange stamp and sharp postmark. 80 (VF) [1911 10 öre Gustav in Round Frame] on neat 1911 ship cover with ÅNGBÅTS PXP No 114 ship cancel (confirmed by illustration on page 81 of Ångbåtspost, by MacFie), to HORN, with clear receiver on reverse. J15 [1922 10 øre Green Postage Due] (VF) tied by 26 July 1922 KJØBENHAVN cancellation on 24 July picture post card posted aboard the Swedish naval ship H.M.S. SVERIGE (apparently near Båstad, Sweden, at the time). 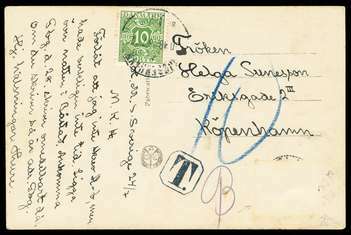 There appears to have been a stamp affixed and canceled at lower right, but it must have quickly come off; there is a Swedish octagonal-boxed "T." handstamp, a blue manuscript Danish "10", and the Danish postage due stamp. If there had been a stamp that had fallen off, this should not have been rated as postage due. 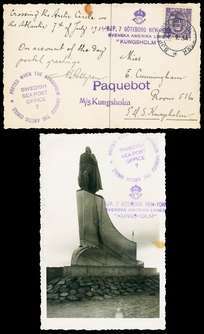 Iceland #117 [1920 15 aur Christian X, still in active use at the time] (F-VF) on 7 July 1934 Icelandic picture post card (real photo of Leif Ericsson statue) mailed aboard and WITHIN the SWEDISH cruise ship M/S Kungsholm, as it crossed the Arctic Circle, presumably after most recently having visited Iceland. Small spot near top. Canceled and handstamped with the seemingly full range (five different) of the official postal cancellations and handstamps available in the ship post office. 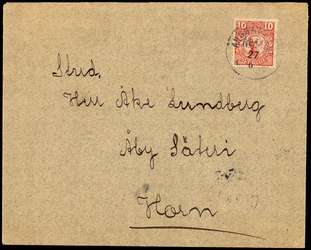 Though I have handled hundreds of Kungsholm covers mailed at sea around the world, this is the first in 38 years that I can recall being mailed WITHIN the ship and probably one of less than five that have borne Icelandic stamps or markings. 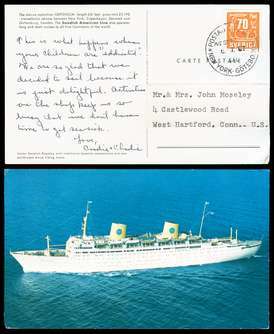 511 [1957 70 öre Rock Carvings] (VF) solo use on 6 July 1967 (just 5 weeks after stamp issue) picture post card (picturing the MS GRIPSHOLM cruise ship at sea) posted at sea on the NEW YORK - GÖTEBORG route. Very attractive.